On Friday and Saturday, join us for live recordings and performances of: God Awful Movies, The Atheist Experience, and Talk Heathen! God Awful Movies will present their trademark humor during the Friday evening program. This is a separately ticketed event. During the Saturday workshop breakout sessions, you can watch live recordings of the Atheist Community of Austin’s signature shows Talk Heathen (1:30 PM) and The Atheist Experience (3:00 PM) on the main stage. What hath God wrought? Some pretty cringe-worthy religious movies, you would know if you regularly listen to the podcast God Awful Movies. From the AACon2019 mainstage, the hosts of the show will not only electrify us, they’ll prove, once and for all, that if god provided divine inspiration, his movies would be a hell of a lot better. And if a higher power really existed, its PR team couldn’t possibly be this bad! Come see the irreverent humor of God Awful Movies in person, as Eli Bosnick, Heath Enwright, and Noah Lugeons unveil and shred a truly terrible religious movie with low production values, terrible writing, and third rate acting. More than being uproariously funny, God Awful Movies digs into the truly nefarious messages spread by movies like Passion of the Christ, All the King's Horses, The Accidental Activist, Miracles from Heaven, and the entire catalog of Ray Comfort's "films." Sure, the movies are poorly made, and it would be charitable to describe the cast members as "actors," but more than that, these movies need taking down because of the harmful, even deadly messages they send. These are movies that tell women that if they pray harder their husbands won’t hit them, that foment anti-LGBT hatred, and that promote prayer instead of medicine. Some even tell those suffering from depression that prayer will prevent suicide. For AACon2019, Noah, Heath, and Eli have promised us an absurd movie of ungodly proportions that only they could dig up. Fans of The Atheist Experience and Talk Heathen, you’re in for a treat! 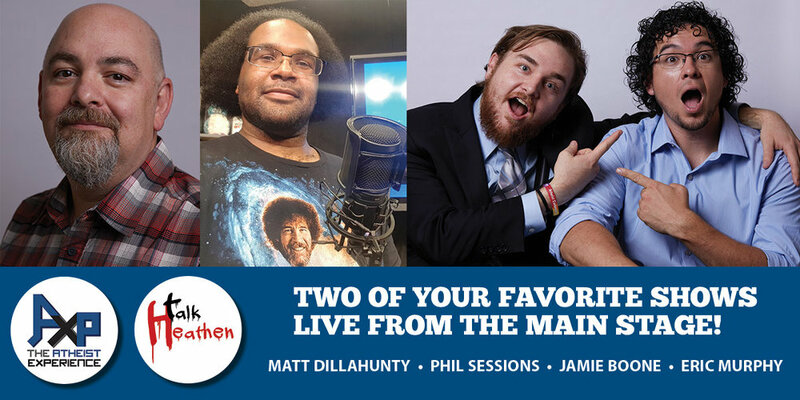 None other than Matt Dillahunty and Phil Session will be hosting a live episode of The Atheist Experience at our 2019 National Convention! First as an award-winning public access TV show, then as a YouTube channel, The Atheist Experience has remained an indispensable voice in the atheist community for more than 30 years! With over 1,000 episodes to its credit, The Atheist Experience is certified American atheist history! Joining Matt and Phil are two heads of the Atheist Community of Austin: Eric Murphy and Jamie Boone! Their fantastic show, Talk Heathen, has taken YouTube by storm with their well-reasoned yet witty responses to callers.